There were about 70 churches before the revolution in Odessa. History of each church is indissolubly connected with the history of the city. For Soviet period lots of churches were closed, destroyed, reoriented in warehouses and fitness - centers and on many years ago, people in Odessa didn’t even imagined, that pious, orthodox citizens prayed about health for their relatives and about well-being and prosperity of whole city in these city’s buildings. Nowadays many of temples are being reconstructed and opened in Odessa and you might be witness of a revival and an inauguration of these temples. Seminary, located near to it and being visited by more than 700 seminarists. Take an excursion to reconstructed in 1998 St. Mary-Magdalena’s church. 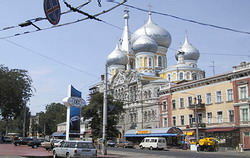 Arrived in Odessa city you will have an opportunity to view such temples as St. Nicolas’ church, St.Martyrs’ Andrew and Natalie church, Greek Church, All Saints church, St. Archangel’s Michael Female monastery, St. Pantelemon Fenale Monastery and other temples, monasteries and churches which can be seen in abundance in Odessa. It is said in Odessa:” Better one time to see, than hundred times to hear” So, there is only challenge for you- to visit our city and to view all this breathtaking beauty with your proper eyes.